Technically, we're a sailboat. 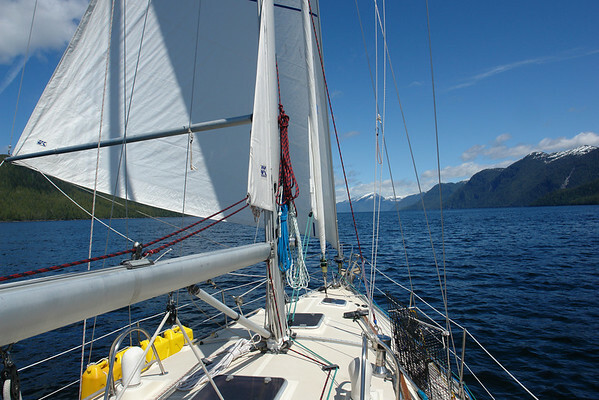 We have a mast and sails and all the accessories you need to sail. We have lines everywhere. We know how to tie knots. We can pronounce "leeward" correctly. Don't let that fool you. We rarely ever sail. At least up here in the north. Most of the time the wind is either howling like a banshee or dead calm. And since we're navigating through narrow channels, the wind is directly behind us or dead nuts on the nose. There are very few instances where we have decent wind (8 to 20 knots) coming from a decent direction (not dead nuts on the nose). So we motor just about everywhere we go. Up here we're a powerboat with a really great VHF antenna. 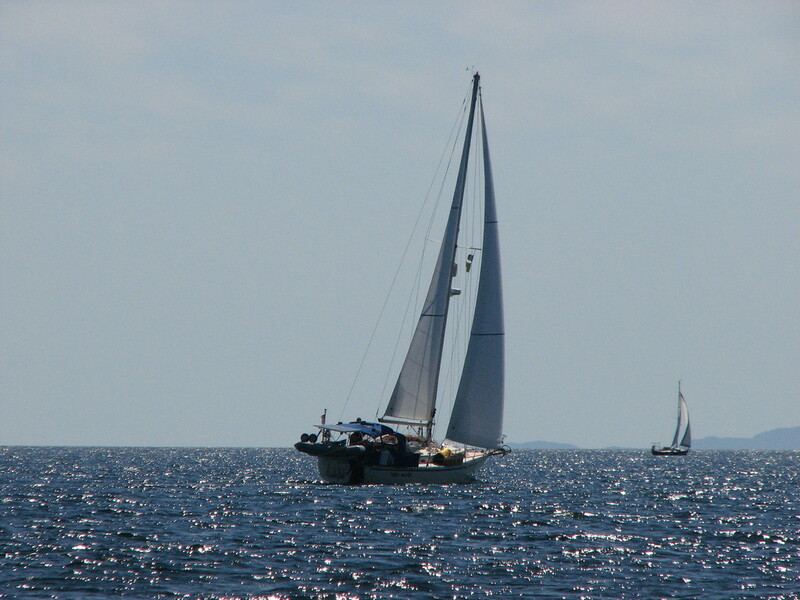 However, every now and again, we will get a confluence of wind speed and direction that's just begging for a sail. 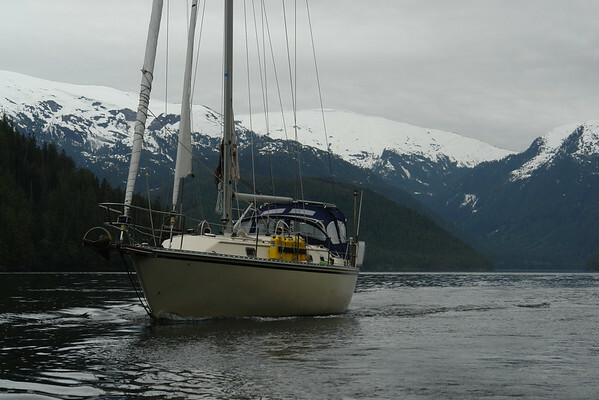 And so it was on the day we pulled anchor out of Rescue Bay headed north into British Columbia's fjordlands. The sun was shining. There was a nice 10 knot breeze coming directly behind us. We set up the whisker pole, pulled out our genoa and shut off the engine. Bliss. 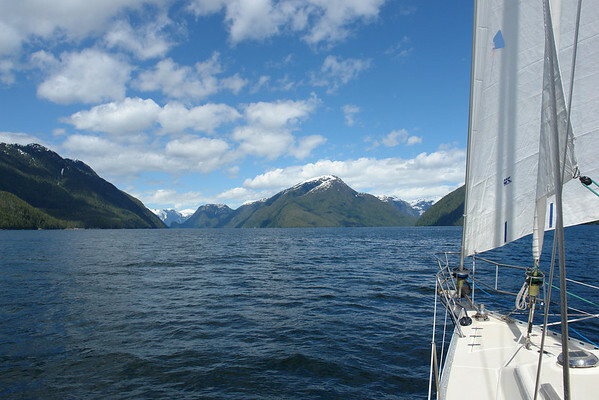 We had a beautiful sail the rest of the afternoon up Mathieson Channel. 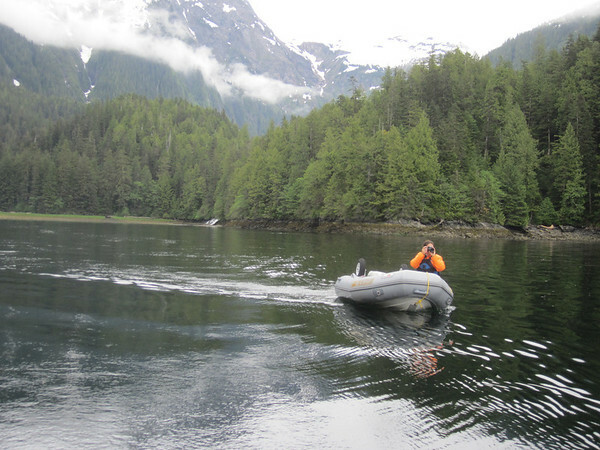 Our destination was Kynoch Inlet. 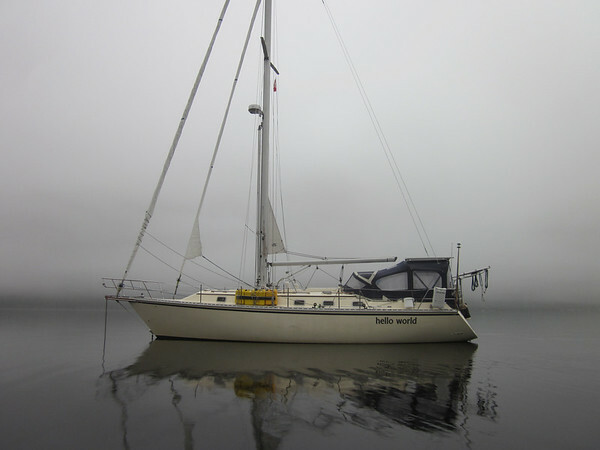 Our new friends on s/v Maclas, Kara and Chris, highly recommended we see Kynoch. 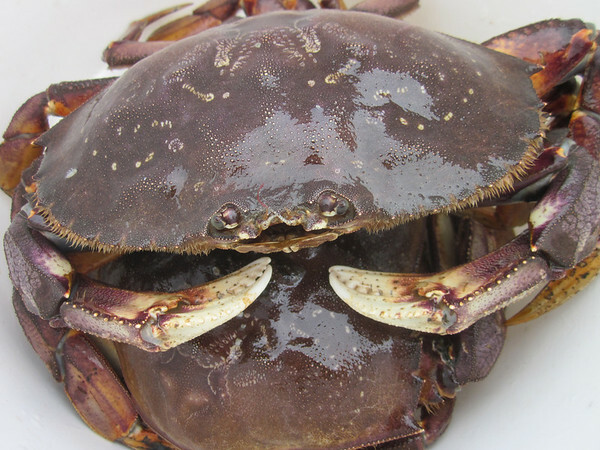 Since they've spent the last six years plying the waters of the BC central coast, we were hard pressed to disagree. 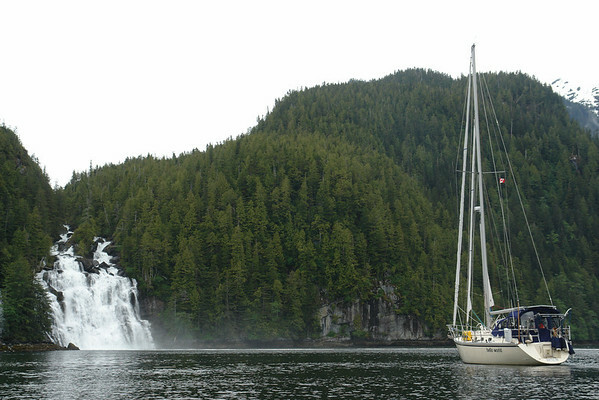 Our friends Greg and Nicole on s/v Baraka seconded the recommendation. Kynoch Inlet did not disappoint. Our fancy whisker pole setup finally gets some use. 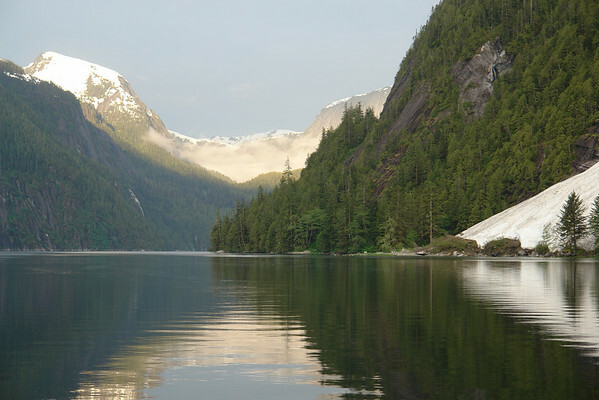 A sneak peek into Mussel Inlet. The view from our anchorage the next morning. Dropping anchor was a little exciting. 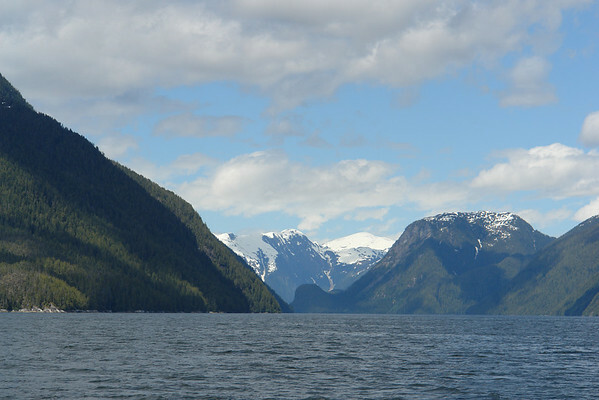 These fjords are very deep all the way back until the end in an estuary. The water depth went from 100' deep to 13' deep in about a boat length. So we anchored out in 100' and once again, thanked our new windlass for pulling up all that chain the next day. No sooner had we gotten settled in when we spied our first brown bear and her two cubs munching the grass in the estuary. 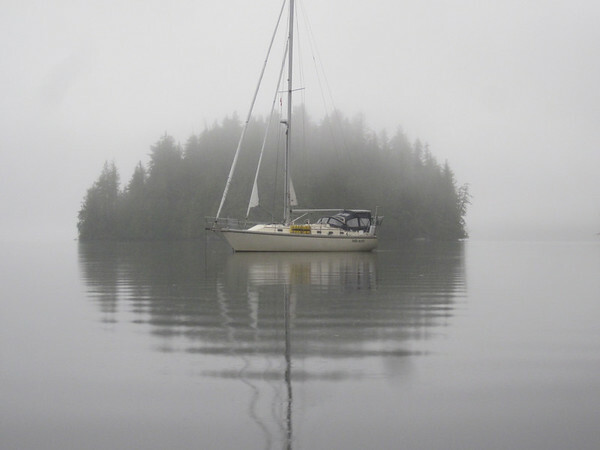 We spent a rainy night at anchor and took off the next morning. 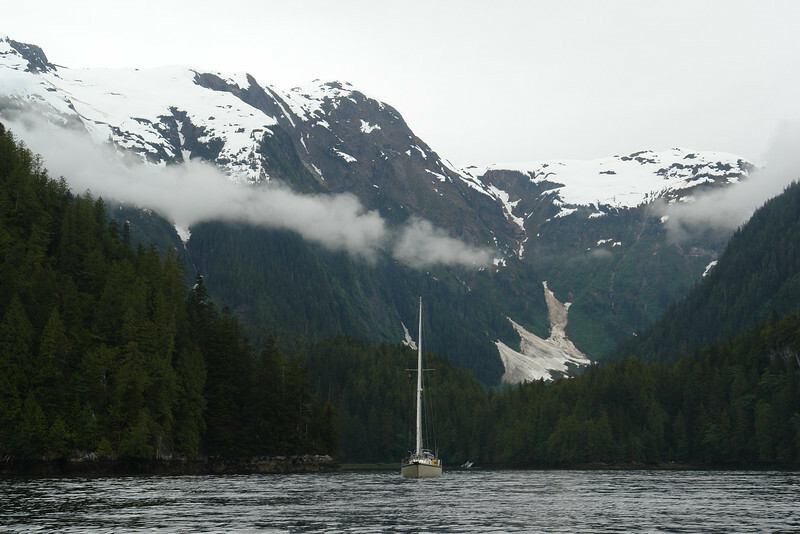 We continued north into Mussel Inlet, the fjordlands becoming more impressive the farther we went. 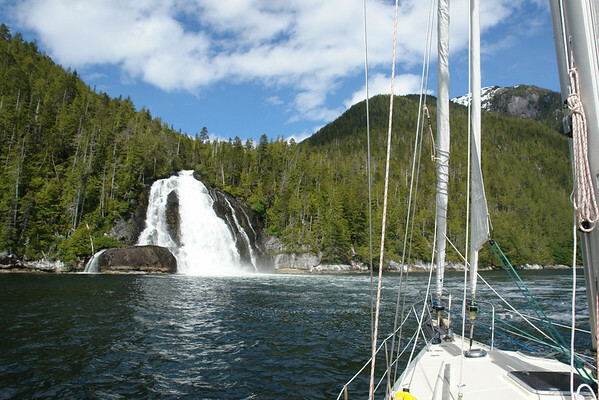 We found another beautiful waterfall in Oatswish Bay. 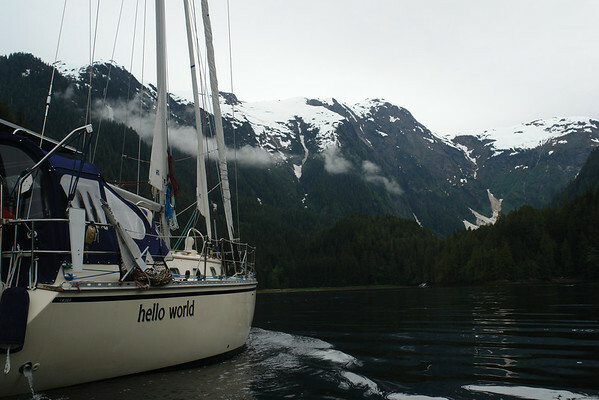 And since we're pretty vain about our boat, we decided to drop the dinghy and take some photos of Hello World. We continued down Sheep Passage and into Windy Bay for the night. We woke up the next morning to the kind of torrential rainfall that almost looks like fog. Cockpit enclosure or no, we decided that was as good a reason as any to light the heater and spend the day in bed listening to the rain. Christy did drop a crab trap and took some photos of the fog that rolled in after the rain. Wow. Thanks for posting these images. I hadn't considered cruising the area you're passing through but after reading about your trip so far and seeing the places you've been, I'll need to consider it. It looks astounding. Awesome pictures! I can't wait to get up there myself. Water looks pretty still! Phenomenal pictures. Why is it that so many cruisers head for the Caribbean when there is this astounding vista?